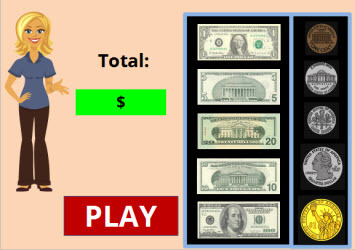 Learn how to solve practical problems about money by playing this fun money game. Game Directions: Click on the denominations in the cash drawer so that they add up to the correct answer. Some answers can have multiple correct answers. For instance, $0.78 might be 3 quarters and 3 pennies, or it could be 7 dimes and 8 pennies, or even 5 dimes, 4 nickels, and 8 pennies. If you make a mistake, click on the reset button to put the money back in the register and start over again. For each correct answer, you will earn a point. This game can be played on computers, iPads, and other tablets. You do not need to install an app to play this game on the iPad. Use the four operations to solve word problems involving distances, intervals of time, liquid volumes, masses of objects, and money. Return from this Money Game 3 to the Money Games or to the 2nd Grade Math Games or 4th Grade Math Games .